We currently brew our most popular brands at our new brewery in Bigfork, five miles north of our Woods Bay location. 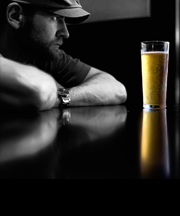 People liked our beer so much we just couldn’t keep up with demand – not a bad problem to have. The new brewery started production in the Spring of 2014. We have a 30bbl brewhouse (31 gallons to a barrel) and eight 60bbl fermentation vessels. As of April 2016 we have added one 60bbl bright beer tank and one 120bbl bright beer tank, which has increased our potential annual capacity to 5500bbls a year. Our brewhouse equipment is manufactured by the W.M. Sprinkman Corporation in Wisconsin. This is our main production facility that also includes our Wild Goose canning line and 50 oak wine casks for our North Shore Project. Closed to the public. Call for information (406) 837-0085. 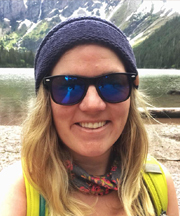 Hometown: I consider my home town Bend, Oregon, I was born in Rapid City, South Dakota and my family dates back four generations in Havre, Montana. What do you do at the brewery? 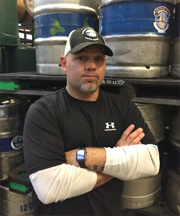 Director of Brewery Operations and Master Brewer, although we all work as a team and we wear a lot of hats around the brewery. Everyone chips in to get the work done. What is your favorite style of beer? Sour beer is by far my favorite style of beer, I have been working strongly with sour beers for over ten years and have seen a huge increase in interest in this old world style of brewing. I enjoy anything aged in Oak Casks, the wood really adds unique characters to the beer. Sometimes you may find me holding a can of King Cobra after a long day of climbing, I try not to be too picky. What brought you to Bigfork? 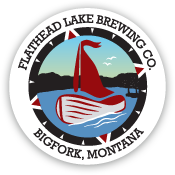 Flathead Lake Brewing Co. brought me to Bigfork, after an 18 year brewing career in Bend, I felt that FLBC would provide creative opportunity to work with a small, up and coming brewery. My family lives in Bigfork and it is really great to be closer to them. Glacier National Park and the surrounding wilderness was another big draw to move out here. Hometown: Born in Coronado, California. First job in Missoula, Montana. Lives in Polson. What brought you to Bigfork? 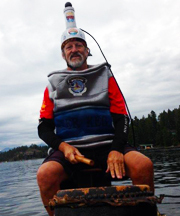 Retired on Flathead Lake and I get to drink all the FLBC beer I want! What brought you to Bigfork? I took a trip out here; and it was love at first sight. I was living in Florida after college and thought it’s now or never to go for it and try mountain living for awhile. That was over 15 years ago! What do you do at the brewery? I plan and promote events at our pubhouse and around Montana. I also attend a lot of brewfests. What is your favorite style of beer? Hoppy beers, like Pale Ales and IPAs, are always my go to choice, but I also enjoy challenging the palate with crazy styles like Farmhouse ales and Sours. What brought you to Bigfork? My family has a cherry orchard on the east shore of Flathead Lake. Growing up, I fell in love with Montana. After coming up one spring to work on the orchard, I applied for a job serving beer in the Woods Bay taproom. That summer job never ended and now Montana is my permanent home! What do you do at the brewery? I manage on and off premise sales of all our products in Great Falls, Helena, Bozeman, Billings, Sidney, and Cody, WY. I’m also responsible for coordinating events in these territories. What is your favorite style of beer? I’m a fan of beer. Period. In the summer I like Pales. In the colder months I like Stouts. I’m always down for a well balanced IPA. 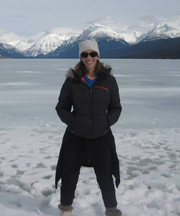 What brought you to Bigfork? Photography, I moved from Chicago to Big Sky and eventually decided to settle in the Flathead Valley to be close to my favorite place in the world, Glacier National Park. As a fan of craft beer and a home brewer, I soon discovered FLBC in Woods Bay and fell in love with their beer. What is your favorite style of beer? I really enjoy some dark Porters and Stouts in the colder months. In warmer weather I will sip on Sours, or Fruit Ales. There is a time and a season for every beer. This is Montana, so thankfully seasons change in the blink of an eye. What brought you to Bigfork? I have dedicated my free time to traveling this beautiful state and discovering all of the amazing beer and sites along the way. 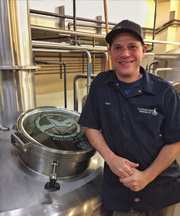 I have learned a lot about beer in the process and Flathead Lake Brewing Company offered me an opportunity to put that knowledge to work. What do you do at the brewery? Clean stuff, then add water to malt, then clean stuff, then add hops. Simmer, then clean more stuff. Sanitize the vessels and make sure our yeasty friends are happy, then spend the rest of the day cleaning stuff. What is your favorite style of beer? Did you say Stout? MMMMMmmmmmm. I love a good dark strong beer, maybe with some years on it. In wood perhaps? What brought you to Bigfork? I heard the citizens of Bigfork needed someone to make lots of beer for them, so here I am! What do you do at the brewery? My days consist of 50% Cellar work & 50% Warehouse/Packaging. Once brewed, I tend to each product and prepare it for distribution. I oversee all packaging procedures, all warehouse needs and maintain inventory to fulfill demand.  I’m lucky enough to work hand-in-hand with the brewers, distributors, our Ale Ambassadors, and warehouse personnel. What is your favorite style of beer? Stout, Imperial IPAs, Imperial Stout, Porters and Barleywine. Mostly anything dark with layers of flavor. What brought you to Bigfork? Beautiful scenery. Quiet, family-friendly way of life. An opportunity to raise a family in one of the most beautiful places in the US.